Your own strength and bodybuilding genetics will have a large impact on whatever training you do. Your effort will too, don't get me wrong, but you need to take genetic factors into account. William Sheldon's genetic somatotypes may be a load of B.S., but the genetic factors down below aren't. And there are more than a few of them; if you do bad on one, you'll probably be doing better on another. Most importantly, though, realize that your own drive will, ultimately, be the main thing determining your level of success. You may not have the genetics of an Olympian, but through diligent hard work (and tons of enthusiasm!) you can make bigger changes than you imagine. Your unique bodybuilding genetics are neither a blessing nor a curse. They're just life. The natural length of your muscles and the build of your skeleton is something that you can't change. They are effected by some environmental factors (e.g. malnutrition can weaken your skeletal structure, long-term habits like weight lifting can strengthen your bones, etc. ), but the majority of them are genetically determined. Your muscle length is the length between where the tendons at each end of your muscle attach to your skeletal structure. Your muscles will never be wider/bigger than they are long, so your natural length plays a part in determining how big your muscles can become through training. On thing to keep in mind is that the length of your muscles varies throughout your body. While you might have long muscles in your biceps that you can show off easily, you may not be able to get that level of definition as easily in other muscles. And it's very rare for someone to have all short or all long muscles. As far as your skeleton, assuming that you are well nourished and relatively healthy, you skeleton will not change a whole lot. Especially in bodybuilding, where the ideal is broad shoulders and narrow hips (with about medium length arms), those perfect ratios are something that you have to be born with. Your bodybuilding genetics determine the number of fat (adipose) cells you have, and where they are on your body. Like your muscles, the number of cells you have is pre-determined, but through your habits (working out for muscle, or eating too much for fat) you can change the size of your cells. Most non-obese people have around 25-30 billion fat cells, moderately obese people have around 50 billion, and extremely obese people can have as many as 240 billion fat cells. This is one of the reasons that some people have so much trouble losing weight and keeping it off. Another thing that your bodybuilding genetics determine is your muscle fiber density. That is, the number of muscle fibers you have per unit area in your muscles. The greater your muscle fiber density, the more fibers (and cells) you have in your muscles. And the more fibers, the bigger your muscles can become. You have the potential for greater size and mass than someone with a lower muscle fiber density. Here's probably the most interesting aspect of how your bodybuilding genetics affects your muscle growth. Myostatin, or, rather, lack of it, is the silver-bullet of strength training. The gene Growth and Differentiation Factor 8 (GDF-8) produces the protein myostatin, which stops muscle cells from becoming larger. So, it actually hinders muscle grown. Most people have a fairly high amount of myostatin in their system, and for good reason - at least evolutionarily. Muscle is a very energy intensive tissue for your body to maintain, so your body wants to have the absolute minimum amount that it needs for your daily life - so that it doesn't waste calories on muscle that it could use for other purposes. Thus most people look, well, normal. You have a genetically determined level of myostatin that's pretty high. However, sometimes people and animals have muck-ups with the gene that produces myostatin. With incredibly muscular results! 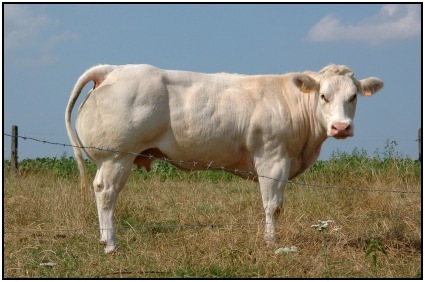 Fun Fact: GDF-8's impact was first discovered in the Belgian Blue cow, which through selective breeding lacks GDF-8. This gives them about 2-3 time more muscle than standard beef cattle have. This mutation also occurs in other animals too. It has been clinically induced in mice, and through intense breeding there are some whippet racing dogs that have it. Very rarely, humans will have a mutation that renders this gene inactive. Very, very, very rarely, like fewer than 5 at any one time. In June 2004, a toddler with this mutation was discovered in Germany, which made many scientists excited to see the development of a child with this genetic defect. There are also pharmaceutical companies with an eye on making a drug that renders GDF-8, or the mysostatin that it produces, inactive. Wyeth Pharmaceuticals developed Stamulumab, (Myo-O29), which binds to myostatin and inhibits its effects. Aside from making tremendous muscle growth possible, it can be used as a treatment for muscular degenerative disorders. Currently it's still under testing for use on humans. I'm interested to see what happens when they've perfected it, and it begins being used clinically. And abused athletically. Are There Other Aspects of Bodybuilding Genetics I Should Know About? No, there aren't any more you need to know about. It's interesting, but it won't give you an edge in your training. If you want to learn more, do some research on ciliary neurotrophic factor (CNTF), interleukin 15, alpha-actinin-3, myosin light chain kinase, and angiotensin converting enzyme. How Do I Find Out If I Have The 'Right' Genetics? Really, there's no easy way to tell what your exact bodybuilding genetics are when you're alive. And for the few things that you can determine, like your number of fat cells, this won't really help you - it can just give you information. So, why even learn this stuff? For one, it gives you perspective on what to expect from your training. If you've been overweight for a long time despite repeated diet attempts, you may have been dealt a bad hand of genetics. But, with that knowledge, keep working at losing the weight. Also, if you show good results after only a little time in the gym, you might have good genes and have a lot of fun doing bodybuilding. Something to think about. To get the best results from a beginner workout routine, record your workouts and see which ones give you the most benefits. Then, work more with the ones that give you the best results. That's really the best way to figure out what your bodybuilding genetics and what your body responds best to. Whatever your bodybuilding genetics, know that for better or worse, you're stuck with them. The only determining factor you control is your actions, not whether you had the right parent or grandparents. So decide what you want for yourself. And go for it. 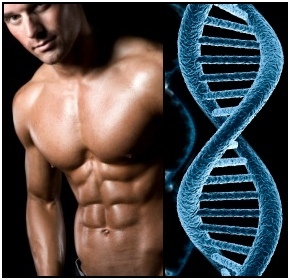 • Click here to leave 'About Your Bodybuilding Genetics...' & go back to the Home-page! 1. McGuff, Doug, and John R. Little. 2009. Body by Science: A Research Based Program to Get The Results You Want in 12 Minutes a Week. New York: McGraw-Hill. Pp. 164.